2018 NFL Mock Draft: Which College Stars Should Pro Fans Follow This Fall? A full college football season lies before us—not to mention an entire NFL slate to shake up the draft order—but here's an early look at the players who will be the talk of next spring. In a mere eight months (a little less, actually! ), the NFL will descend on an as-yet-undetermined city for the 2018 draft. And, sure, there’s still an entire season to be played before then—starting next Thursday—but the draft process itself is well underway. Hell, the Jets have been in tank mode for months. To help get the ball rolling, let’s dive in on our first mock draft of the college football season. The order for this draft, as is preseason tradition, comes from each team’s respective Super Bowl odds (courtesy of VegasInsider.com). Small adjustments to that odds-based order have been made to accommodate how the NFL uses playoff results to fill in picks 21-32. This being a mock draft, there was an attempt made to fill projected team needs with an appropriate pick. Seeing as how the draft itself is still off in the distance, though, the main purpose here is to introduce everyone to players that could form the heart of the 2018 draft class. For all the buzz surrounding Darnold headed into the year, it’s worth remembering that he has just 10 starts to his credit. (That’s not at all unusual for a redshirt sophomore QB, but there’s a long way to go before teams have a complete picture of him formed.) The talent, though, is undeniable, and a full season spent under the draft microscope as the potential top prospect would be a decent test drive for a future in NYC. Sunday’s intriguing UCLA–Texas A&M showdown in the Rose Bowl will be Rosen’s first action since Oct. 8 of last year, after which Rosen needed shoulder surgery. Will he be the same QB (or a better one) coming back? Will that shoulder issue pop up again, in some fashion, during the 2017 season? His coach Jim Mora told Yahoo!’s Pete Thamel a couple weeks back that he didn’t believe Rosen would enter the ’18 draft, but a huge season could all but lock Rosen into the top five. Unless the 49ers figure out a long-term plan under center between now and April, they’ll be hunting the position early. Another superstar-in-the-making returning from injury—James injured his knee in early September last year, then took a medical redshirt. If he stays healthy, odds are very much against him finishing out his three available years of eligibility. He’s a dynamic presence in the secondary, with the downhill game to make plays in the backfield (9.5 tackles for loss, 4.5 sacks in 2015). Pairing James with Jabrill Peppers would give the Browns an electrifying safety tandem, in a defense that’s growing increasingly athletic. We just saw Alabama star linebacker Reuben Foster tumble almost out of Round 1 due to off-field and health concerns. His was a unique case because he was sent home from the combine, but Key will face a lot of the same questions. He took a leave from LSU in February for “personal reasons” and he’s going to miss Saturday’s opener against BYU with a lingering shoulder problem. At 100%, he can take over games off the edge using a polished repertoire. Key and Leonard Floyd together? Good luck, offensive tackles. Jalen Ramsey landed at No. 5 in 2016, then Jamal Adams grabbed the No. 6 spot in this year’s draft. Fitzpatrick could make it three straight years with a DB in the top 10, in no small part because he offers cornerback/safety versatility—not to mention a 6' 1" frame and reported sub-4.4 speed. Trumaine Johnson may not be long for the Rams’ roster. Even with him, that’s a secondary that could use another playmaker. That the Bills and Tyrod Taylor eventually will part ways is the league’s worst-kept secret right now, but there’s not an obvious long-term answer at QB behind him on the depth chart (maybe rookie Nathan Peterman in time; he’s nowhere near that level yet). Buffalo has to find a quarterback. And Rudolph, all 6' 5" of him, has the size, arm and experience to crash the presumed Darnold–Rosen–Josh Allen party atop the draft. Clemson played Wilkins at defensive end last season. At 315 pounds. So, that should offer some indication of what Wilkins is capable of as an athlete. Now that Carlos Watkins is on the Texans, Wilkins should spent much of 2017 back inside at tackle, but he offers the Tigers the option of moving him around. While Washington improved its front by picking Jonathan Allen this year, it’s still shy a force up the gut. McFadden figures to see Calvin Ridley quite a bit in Saturday’s Alabama–Florida State clash, giving him a chance to make an early statement. The junior is a long (6' 2") corner who makes it difficult for receivers to come clean off the line. In other words, he’s exactly what most man-coverage NFL teams go berserk looking for each draft. The Dolphins have added a couple guys like that of late; McFadden offers a higher ceiling. McGlinchey reportedly received a first-round grade ahead of last year’s draft—and he deserved one—only to return to school. In doing so, he became a legitimate top-10 possibility for this year’s class. He has the size (6' 7", 310 pounds) and quick feet necessary to be an answer at left tackle. By adding him to current rookies Forrest Lamp (who’s out for the year) and Dan Feeney, perhaps the Chargers could finally turn their O-line into a strength. Fair or not, the direction of any Allen conversation over the coming months hinges on what he does Saturday, when Wyoming visits Iowa. Pick apart the Hawkeyes’ tough defense, and Allen will generate an awful lot of personal momentum. He’s another 6' 5" QB with a big arm, but Allen also fired 15 interceptions last season and is a work in progress when it comes to his mechanics. The Jaguars will have to find a QB next off-season. Would Allen strike too many similarities to Blake Bortles? Landry claimed the 40th spot on our preseason Big Board a year ago, and had he entered the 2017 draft he would have been a Day 2 pick, at worst. Now, the sky’s the limit for him as he wraps his college career. Landry notched a whopping 16.5 sacks in ’16, but he’s also a force against the run (22.5 tackles for loss). He probably could start for the D-line-starved Lions in Week 1 this season. Too low? Maybe. It’s still tough to get a read on how teams perceive running back draft value, but the pendulum has swung in the position’s favor—Ezekiel Elliott at No. 4 two drafts ago, Leonard Fournette and Christian McCaffrey in the top 10 this year. Barkley could be viewed in a similar light (and he’s already being compared to Elliott). Colts fans might need a minute to wrap their heads ’round a Round 1 RB again, but Barkley’s powerful, explosive style would get them there. As SI’s Bruce Feldman pointed out in July, Texas has not had an offensive linemen taken in Round 1 since 2002 and hasn’t had one drafted at all in a decade. Williams (6' 6", 310 pounds) has what it takes to snap both streaks in April. NFL teams will love his run blocking and should spot potential in his pass protection, too. 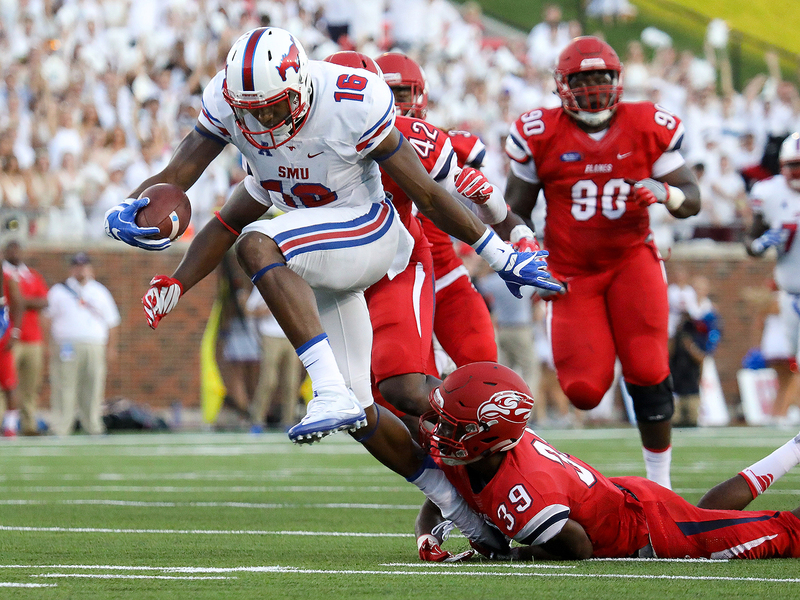 SMU's Courtland Sutton has the physical frame and the eye-popping production to command the NFL's full attention. The Ravens were linked to many a receiver during the ’17 mock season, and Jeremy Maclin’s arrival does not fix all their issues, especially with Mike Wallace an impending free agent. So, what does Sutton have for an encore after a 1,200-yard, 10-touchdown redshirt sophomore season? He’s big (6' 4") and physical, with a knack for making difficult catches. As Fournette was pushing toward a top-five draft slot last fall, Guice was busy leading LSU in rushing (1,387 yards, 15 TDs). Guice is a game-changer, so much so that a handful of teams may prefer him to Barkley. As with the Ravens at 14 (and Cardinals at 19), this pick is doubling back on a popular position-team match from the past year. Chubb would have likely been an early-round selection had he entered the ’16 draft—he’s a well-rounded, three-down defender off the edge. He does not always jump off the tape like Key, but he did produce 21.0 tackles for loss and 10.0 sacks last season. At the least, the Saints need to continue to build depth at end. Vea eats up space, as one would expect from a 6' 5", 330-plus-pound tackle, but he’s much more than a two-down wall. He can wear interior linemen out because of his strength-athleticism combo, and the Titans do not, at present, have a force like that inside. Whatever a team may ask of its safeties, Harrison can handle, including dropping down over the slot. In fact, his skill set is diverse enough that a rise toward the top 10 is far from out of the question. The Bucs started their safety overhaul with ’17 second-round pick Justin Evans; they could complete it here. The Cardinals’ recent draft history certainly points toward someone like freakish Kansas edge defender Dorance Armstrong. At some point in the very near future, though, they have to replace Carson Palmer. Falk is 6' 4", experienced and sees the field well. The big hurdle here might be convincing Arizona coach Bruce Arians to invest in a QB out of the Air Raid system. Ohio State has one of those programs that just churns out NFL-caliber talent to replace departed draft picks, and Ward’s time in the spotlight has arrived. At 5' 10" and 191 pounds, he’s shy of the ideal CB height, but he can fly and won’t hesitate to pop a receiver. The Vikings could be ready to try again at cornerback if Trae Waynes doesn’t emerge this season. Julius Peppers is a one-, maybe two-year option for the Panthers’ pass rush. They need young blood on top of 2017 third-rounder Daeshon Hall. Lewis has plug-and-play potential in a 4–3 scheme because of what he can do against both run and pass. He can rock blockers back on their heels with a strong punch. A member of SI’s preseason All-America Team, Smith is a rock against the run, but he also had a three-interception game back during his freshman season. The Broncos have found some stability at linebacker, thanks to Brandon Marshall and Todd Davis. A player like Smith would patch any remaining holes. Kansas is a combined 2–22 over Armstrong’s first two seasons, so you’re forgiven if you have not seen him play. Make a point to do so this year. He can be a solo wrecking crew in attack mode, with the speed to go sideline to sideline. If the Bills take a QB early in 2017, they’ll have to devote other resources to rebuilding a defense for Sean McDermott. After one more year of blocking the SEC's best edge rushers (as he did last year against No. 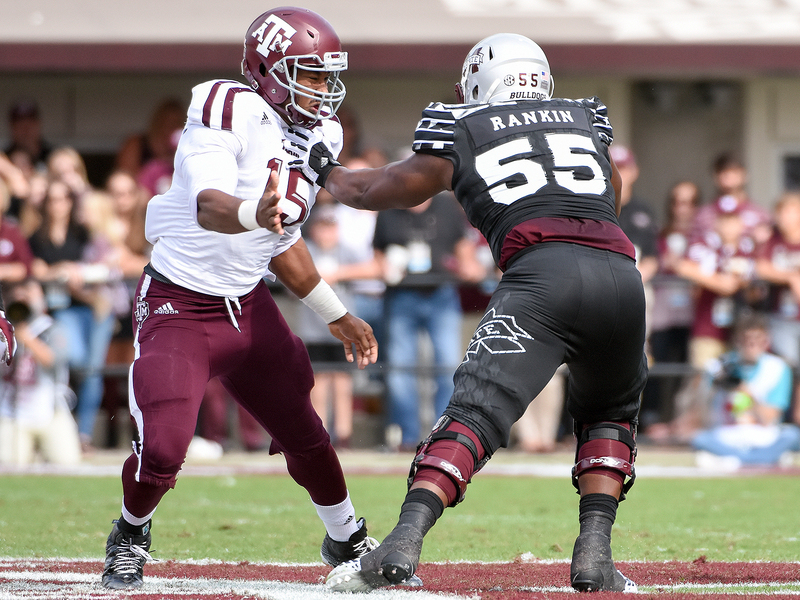 1 pick Myles Garrett), Mississippi State's Martinas Rankin could be headed for Round 1 himself. Just going to keep slotting the Giants in for either an offensive tackle or a linebacker until they spend a high draft pick on one. Rankin has bounced between OT and center for Mississippi State, a versatility scouts always covet. Louisville clocked Alexander at a 4.32 40 time in the spring so ... yeah. Schools tend to err on the side of the player with the stopwatch, but there’s little doubt Alexander can pick ’em up and put ’em down. Alexander, who picked off five passes last season, would upgrade what stands right now as arguably the weakest position on Cleveland’s roster. Chris Wormley and Taco Charlton were the headliners for Michigan’s D-line last year; Rashan Gary will carry the torch this year. But the Wolverines (and their opponents) are well aware of how critical Hurst is inside. He’s tough to run on and gets to the QB on occasion, a must for any tackle eyeing Round 1. By next draft, Oakland may be ready to commit major resources to its interior defense. The guard position doesn’t tend to see much Round 1 love. When an elite talent comes around, though, teams pay attention. The Cowboys know this better than anyone—their ’14 Zack Martin pick was an absolute home run. Setting Nelson’s bar near the Martin level is an unfair ask, but it may not be an unrealistic one. Mason Rudolph’s favorite target (1,380 yards and 10 touchdowns last season) plans to play through a hernia injury in ’17, so we’ll see how much that impacts his production. Defenses sure have not had much luck slowing him down. The Falcons are not necessarily lined up to need a receiver ahead of next year, but a player of Washington’s caliber could be too much to turn down. Why, hello there! Even if 2017 even is not Ben Roethlisberger’s last hurrah, that time is coming. The dazzling Jackson, last year’s Heisman winner, has at least one more season to prove that his game—especially through the air—can translate to the next level. He’d be a lot of fun combined with Pittsburgh’s other playmakers. Could Nnadi really go a round earlier than his former teammate, Demarcus Walker, the ACC 2016 Defensive Player of the Year? He could, and a team that values movable parts inside—as the Seahawks do—would be the likely landing spot. Nnadi is a headache at the point of attack, capable of creating havoc from a variety of alignments inside. ESPN’s Todd McShay stole a little of the FCS sleeper thunder earlier this week by ranking Goedert as the ’18 class’s top tight end. No worries. Goedert’s not listed here just for the heck of it—he is a problematic matchup for opposing defenses, be it outside, inline or from the slot. Partnering him with Martellus Bennett in Green Bay would be lethal. Jefferson played inside for the Longhorns a year ago, and he’s penciled in on the outside of the 3–4 scheme this season. If the transition clicks, look out. Jefferson has loads of talent and athleticism—he just hasn’t tapped into all of it. The Patriots would be able to help with that drive by bouncing Jefferson all over their scheme.